Initial sketches and details regarding a new high school uniform dress code at Muskegon Heights public school academy system were revealed at the district’s board meeting Monday night. While promised at the first public meeting after Mosaica signed on to provide educational services for the district, the uniform plan represents a transition that was put off for a year because of a high level of opposition from parents on the matter. Middle school and elementary school students made a soft transition in 2012, but high school was tabled and revisited this spring. High school principal Carla Turner-Laws also stated that the uniform development process focused on three main criteria: using existing school colors, zero tolerance for sagging pants, gang paraphernalia and skimpy female clothing. Concept sketches of the proposed uniform were shown at Monday’s meeting. The drawings showed a tucked in white shirt, black tie and bright orange sweater vest for both boys and girls. Girls had the option of a black skirt, skort, Bermuda shorts or pants, and boys had Bermuda shorts and pants to pick from. Turner-Laws indicated that the move for uniforms had student support, from a group known as the Grass-Roots Student Leadership Team. The group offered ideas on the dress code, colors and acceptable attire that will be displayed at a parent meeting in the coming weeks. While no date was set as of Monday evening, the proposed parent meeting will be held before June 14 and will include details on pricing, vendors, as well as avenues for financial assistance. 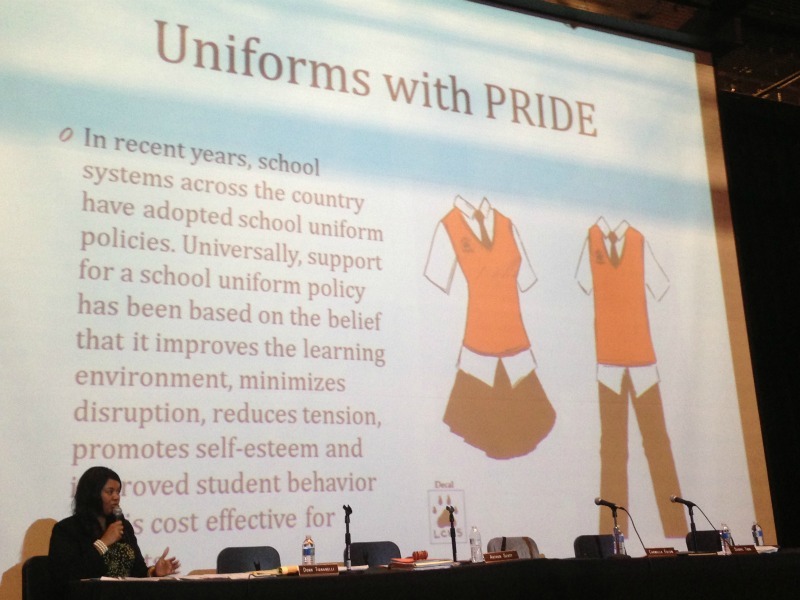 Uniform options would be modeled, including the possibility of some extended options discussed by students who had input. Prices were presented at Monday night’s meeting. Prices presented at the meeting were averages of prices found at six local retailers, according to Turner laws. All clothing options listed for boys and girls ranged from $11 to $20 average price across Wal-Mart, JC Penney, K-Mart Yonkers, Sears and Old Navy. As part of the uniform code, families must have the district’s logo embroidered onto their shirts, which can be done at Jones Sporting Goods through an arrangement set up with the charter system. Monday’s presentation stated that parents would be notified of the new uniform policy by May 31, with a parent meeting happening by June 14. Currently, no standard public school system in the county wears uniforms, though many have dress code standards. Several charter and private schools do have uniforms, including Muskegon Catholic Central and Timberland Charter Academy. Currently, K-8 Muskegon Heights students in the district where a khaki and blue uniform scheme. There was no word Monday night if K-8 would evolve to match the proposed black and orange uniforms of the high school in the future.